MEMPHIS, Tennessee, July 7, 2011 (ENS) – FedEx Express is expanding its fleet of all-electric and less polluting, energy efficient vehicles. FedEx Express will place 24 new all-electric vehicles into service by the end of August, expanding to three new cities and more than doubling its fleet to 43 EVs. The world’s largest express transportation company is bringing new all-electric delivery vehicles to New York City, Chicago and Memphis, and diversifying its existing Los Angeles fleet. At the same time, FedEx Express will be adding more hybrid-electrics and upgrading over a tenth of its conventional vehicle fleet to more energy-efficient vehicles. “We are using efficient technologies that are readily available now, while investing in innovative technologies that we hope and believe can be vehicle workhorses for the future,” said Dennis Beal, vice president of global vehicles at FedEx Express, a subsidiary of FedEx Corp.
“Our goal has always been to optimize and operate our vehicle fleet in an economically and environmentally sustainable manner, so that emissions are reduced while serving our customers in the best possible manner,” Beal said. In all, FedEx will add 15 Navistar eStar electric vehicles and five Ford Transit Connect Electric vans, as well as two Freightliner Custom Chassis Corporation eCell electric vehicles and two FCCC electric vehicle retrofits. These will complement the current 19 EVs now deployed in Los Angeles, London and Paris. Not just an expansion in vehicle count, the new EVs will be studied to help evolve electric vehicle technology and to model the impact of future electric vehicle growth on the shared energy grid. In New York, FedEx Express will be working with General Electric and Columbia University’s Engineering School to study energy grid impacts. In Chicago, FedEx Express will be comparing different all-electric vehicle technologies to determine what works best for its fleet needs. In Memphis, FedEx Express is utilizing Enova Systems flexible drive technology to retrofit existing vehicles to make them all-electrics, saving resources through using existing vehicle bodies. Also in Memphis, FedEx has added five Ford Transit Connect Electric vans to support its corporate Information Technology Asset Disposal program, driving scheduled routes to pick up, recycle, reuse and dispose of IT assets. In Los Angeles, FedEx Express is adding an FCCC eCell to its current four Navistar eStar all-electric vehicles, and is in the midst of adding 45 new FCCC-Eaton hybrid-electric pickup and delivery vehicles to its fleet. On high-mileage routes, FedEx is upgrading vehicles with 4,000 fuel efficient, lower emitting BlueTEC clean diesel Sprinter vans. Each Sprinter is at least 100 percent more fuel efficient than the most commonly found alternative it replaces. 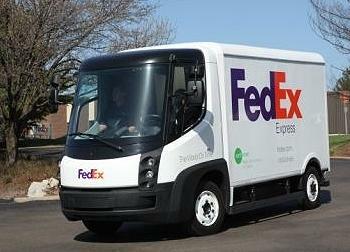 FedEx says the company is committed to improving its overall vehicle fuel efficiency 20 percent by 2020.